This is such an easy and simple recipe and once you make this dish you will never want to buy take out again. You can make this dish so many ways by adding different vegetables or ingredients such as frozen green peas, shredded carrots, scramble eggs or mushrooms this is a versatile dish. In a medium size pot bring water to a boil and salt the water. In the mean time deveined the shrimps rinse and let drain then season them with the next 3 ingredients and set aside in a bowl. In a large wok or skillet on medium heat add 2 tbsp of the olive oil and add the chopped onions, scallions, bok choy and stir for about 3 minutes then add the garlic and red pepper flakes, careful not to burn the garlic stirring constantly not to let the ingredients stick to the wok, once the onions are translucent remove the ingredients and set aside in a bowl. Add the broccoli florets to the water and boil for about 3 minutes then remove and place in a bowl of ice water to stop the cooking process. Once cooled, drain and set aside. 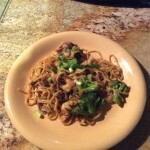 In the mean time add the frozen Lo mien to the boiling water and let cook for about 6 to 8 minutes until aldente'. Once noodles are done using kitchen shears cut the lo mien into halves careful not to burn your fingers, they are long so randomly cut into halves then drain immediately and set aside. Add to the wok the remaining 2 tbsp of the olive oil, add the deveined shrimps and cook 2-3 minutes they will continue to cook as you add the sautéed onions, garlic and bok choy, (stirring constantly) add the broccoli, the soy sauce, stir fry sauce, fish sauce and the lo mien noodles using a tong to incorporate all the ingredients. Garnish with the fresh parsley and serve immediately or keep warm until ready to serve. the noodles. *This dish requires constant stirring it is a quickly made dish so pay attention to the dish while in the wok, if you feel you may need to add more olive oil just so it does not stick add about 1-2 teaspoons more, you don't want the food to stick to the wok or skillet.